I want to keep the following thing I wrote from disappearing into the nether-regions of old Facebook posts, so I’m copying it here as well. This won’t make a great deal of sense to most people who come to this blog, so I will give a bit of explanation. Last week, our youth group met at a different church (that is, not our church). During our meal together, one of the youth at my table noticed a clock that had the regular twelve-hour dial as well as the numbers 1-31 in a smaller size on the outside of the regular time circle. One of them wondered what those numbers were for. I immediately suggested that because of Sweden’s northerly latitude they had a different way of reckoning time than we do—that their day has 31 hours, rather than 24 (several of our local churches are of Swedish heritage). This story kind of blew up from there (and I didn’t resist): I hammed it up during announcements, coming up with the phrase “Swedish Reckoning,” suggesting that there had been a great coverup by their parents and grandparents, and noting that the Dutch had been joking about the Swedish Reckoning for generations. Youth were searching Google for verification of the existence of the Swedish Reckoning and the 31-hour day. Of course, they couldn’t find anything because Sweden has sensored all Swedish Reckoning information and records, much like China exercises some control over the internet. Last night at youth, during dessert, I told the youth about the Swedish Reckoning (SR). They had no idea what this was, which doesn’t surprise me, as the history of the SR has long been covered up and distorted by half-truths and misinformation. There is a remnant of SR at the New Sweden Church, where we met last night. There is a clock that has both the regular twelve hours on it as well as, in smaller numerals, the 31-hour clock, which was historically the Swedish breakdown of the day. In recent years, this has been denied and some have tried to explain the 31 numbers on the clock as denoting days of the month. Of course, this is a thin line of reasoning, as this would not account for nearly half of the months of the year. No, owing to local Swedish mythology, which quite naturally grew out of their extreme northerly latitude, a day was divided into 31 hours. The clock at New Sweden reflects the desire of Swedish settlers to be able to communicate and engage effectively in non-SR cultures by including the 12/24 hour system. Today, SR is not observed anywhere in the world, other than for ceremonial purposes and at heritage sites, as well as a small sect which lives in a commune in the north of Sweden. I bring this up because this weekend is the time change, where here in Alberta and across much of the world, we set our clocks back an hour on Saturday night/Sunday morning. Interestingly, the time change in SR was a little bit different than ours, and a lot more confusing. There was no simple “Spring Forward” or “Fall Back” for them, with a an easy adjustment of an hour. Instead, under the SR, in the fall their clocks would be turned back by three and a quarter hours and then three hours later, turned forward by an hour and twenty minutes. The procedure to move the clock forward under SR in the spring was so complicated that a 350 page book was published by the Swedish government. As an interesting side note, twice each year a small community in northern Sweden celebrates the Swedish Reckoning in a ceremony involving 31 baked pies, a complicated dance sequence (“3.25 steps back, 1.3 steps forward”), and a public reading of Guidelines for Time Adjustment at Vernal Equinox Under the Swedish Reckoning, which has become a sort of religious document for this sect. Their ceremonial garb includes colourful robes, clock hats, and socks in sandals. This entry was posted in Humour & Tomfoolery and tagged humour, SR, Swedish Reckoning, time, tomfoolery on November 3, 2014 by Marc. “Several small cups, one for each of them…” Funny ’cause it’s true. This entry was posted in Faith, Humour & Tomfoolery and tagged church, communion, Faith, humour on November 24, 2011 by Marc. Kottke.org posted this amazing video of the lyrebird, which apparently can mimic almost anything (car alarms, chain saws). It’s almost unbelievable. This entry was posted in Environment/Nature, Humour & Tomfoolery and tagged humour, lyrebird, nature on September 20, 2011 by Marc. Madeline: Luke started crying because I was making him laugh. Luke: Well it hurts when I laugh. Madeline: Luke, laughter is good medicine. Me: They say laughter is the best medicine, Madeline. “It’s good for what ails ya,” as Opa used to say. Madeline: What does “ails” mean? Luke: Is it good for eczema? Me: No, but good question, Luke. Me: “Ails” means something that makes you sick or hurts you. Me: Good point, Madeline. I guess laughter is the best medicine except for when laughter is the thing that is hurting you. This entry was posted in Family, Humour & Tomfoolery and tagged conversations, Family, humour, Laughter on September 13, 2011 by Marc. This week the kids spent some time at a friend’s house and made some masks. This morning they dressed up with clothing appropriate to their costumes. 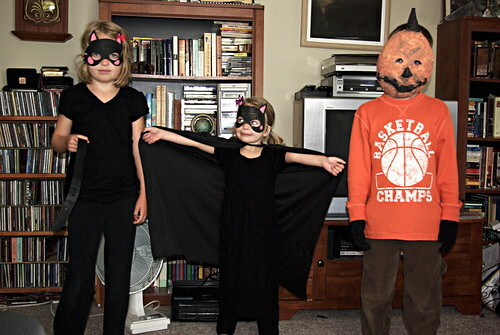 Madeline is a cat; Olivia is a bat; and Luke is a pumpkin. With lunch, they decided that they should drink something appropriate to the animals they were dressed as. Madeline, being a cat, wanted milk. Olivia, being a bat, wanted to drink something red like blood, so she chose cranberry juice. Luke, being a pumpkin, wanted iced tea, which is brown and is therefore, in his own words, “worm poop juice”. This entry was posted in Family, Humour & Tomfoolery and tagged Dress Up, Family, humour, the kids, Worm Poop Juice on July 23, 2011 by Marc. SPOILERS I’VE DELIVERED TO ENGLISH LIT MAJORS. Bartleby is a lot like humanity in his preferring not to. Peyton Farquhar sure has an active imagination at Owl Creek. Your close reading skills and knowledge of symbolism will not be rewarded in your job as a lawyer or coffee barista. RADIOHEAD AT THE CULINARY INSTITUTE. PALEOLITHIC BRYAN ADAMS: A PLAYLIST. There is more fun over at McSweeney’s Lists. This entry was posted in Humour & Tomfoolery and tagged humour, lists, McSweeney's on May 12, 2011 by Marc. This entry was posted in Humour & Tomfoolery and tagged conversations, England 2010, humour on July 29, 2010 by Marc. This entry was posted in Humour & Tomfoolery and tagged Also Sprach Zarathustra, humour, music on July 28, 2010 by Marc. This entry was posted in Fiction, Humour & Tomfoolery and tagged comic, humour, melancholic maritime fiction, Reading on July 22, 2010 by Marc.